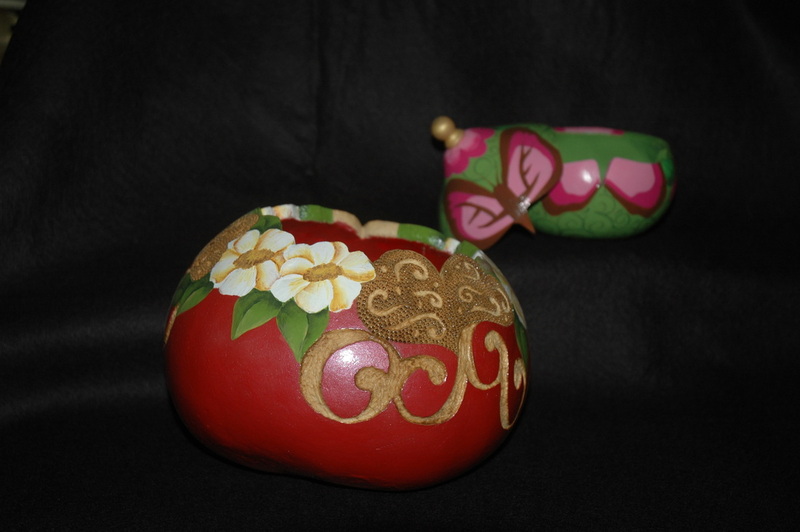 _These two gourds have a Lift Off Top and Hinged Gourds can be used for fine jewelry art, collectibles or just decorative art work for your home. 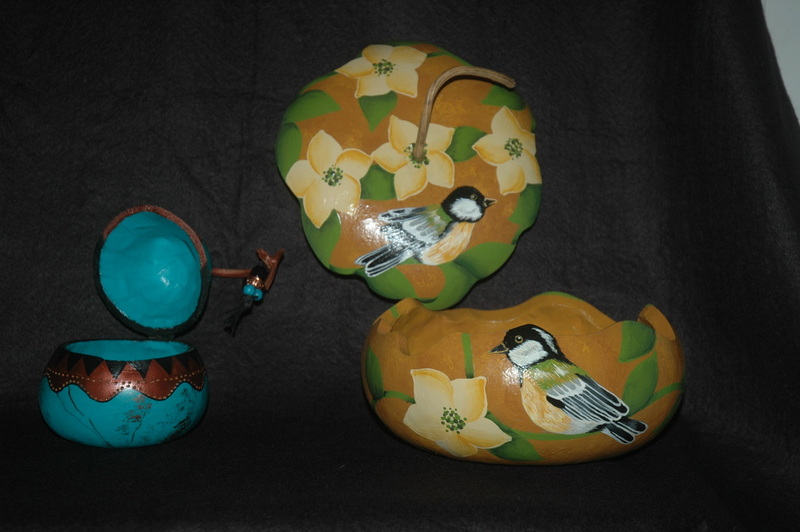 _We also have a variety of Bowl and Vase Painted Gourds, (not shown) to choose from that can be used for a variety of uses besides just Beautiful art work. 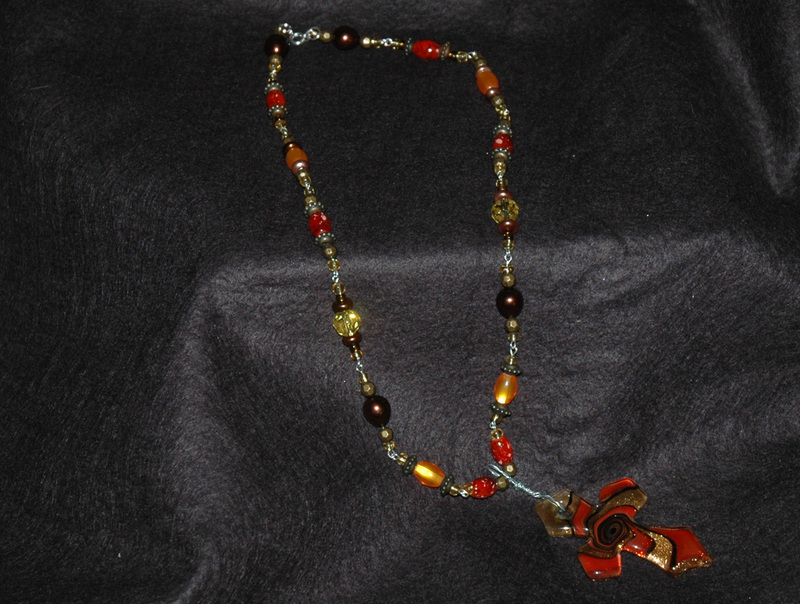 _This Necklace is just a sample of what we have on our site Beautiful hand made beaded necklaces. 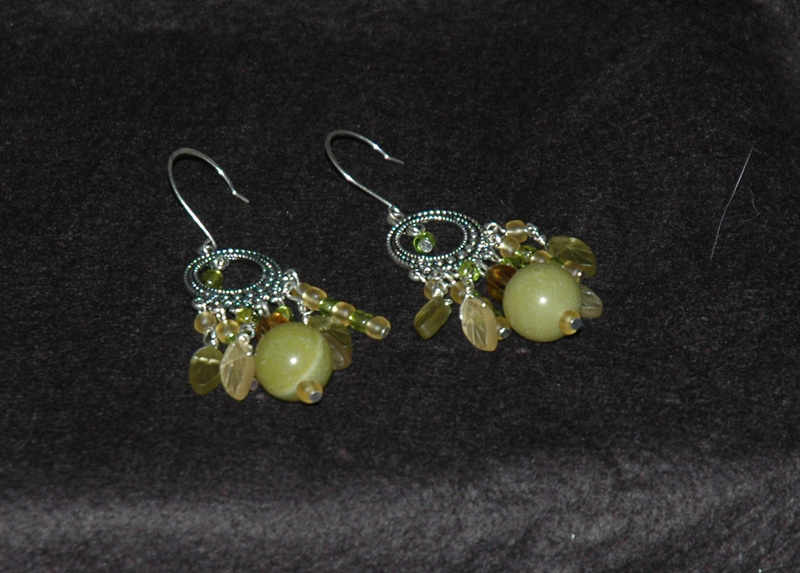 _This is a sample of our Handmade Earrings Fine Jewelry. 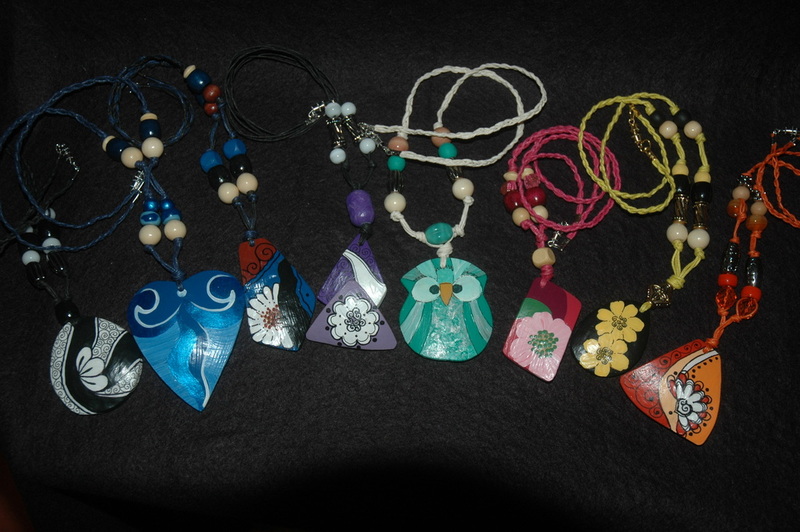 We have all different kinds some that match with our Beaded Necklaces. _These pieces are the left over Gourds parts from the Bowls, Vases and Egg Bowls were crated into different shapes and Beautifully Painted with different designs and then with a Recycled Paper Rope and Beads made into a Beautifully light weight Jewelry Necklace. Welcome: to our New Art Gallery Online this site was built for the love of all Art Work we hope that you will enjoy the Quality Fine Art Galleries on this site and, that you will come back and visit us as many times as you like. This site is composed of Abstract Art Galleries at very low prices. Pieces like our Painted Gourds, Fine Jewelry, and Christian Fine Art Paintings but you don’t have to purchase our art in order to visit our Art Galleries Online. We enjoy just showing our Fine Art Work and hope that it will bring a little joy into your life and, if you would please, tell your friends! This site is an All Original Fine Art Gallery. It will be constantly changing as pieces are sold because each piece is unique. We hope to be adding many more Artists Work to our Fine Art Galleries in the near future with all their original Fine Art Work. 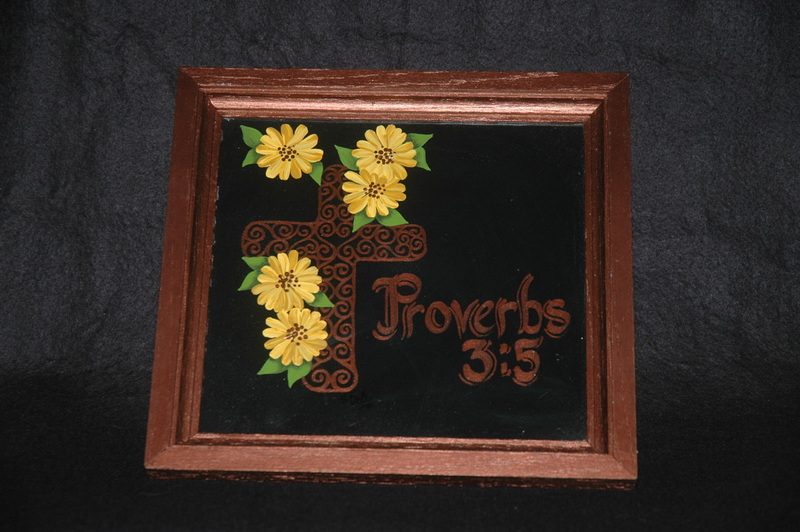 Right now, we are planning to add Painted Furniture, Photo Art, and Wood Work Pieces to our already posted Painted Gourds, Fine Jewelry and Christian Art Paintings. Also, we are planning to bring in all types of Decorative Art Teachings, with classes, to help people learn how to do their own Beautiful Fine Arts Work through our Art Gallery On Line. _If you would like to contact us for more information, questions, comments, or ideas for this site please go to the Contact us at the bottom of the page. From The Cross Art Studio, Abstract Art Galleries, New Art Gallery Online, Fine Art Gallery Painting, Fine Jewelry we would like to thank you for visiting are Art Galleries site and hope that you enjoyed are Gourd,Paintings, and Fine Jewelry and hope you will come back soon.